Power Creep is damaging the Commander format. I don’t say this with a Chicken Little, “the sky is falling,” mentality. This isn’t something that will bring the format to its knees in the next year or two. I’m suggesting Commander as a format is less fun now than it was five years ago, and even less fun than it was ten years ago, and I think that is due to power creep. To fully explain why this is the case, we have to set a few parameters, and the first one is to agree that there is Power Creep in the Commander format. For anyone who has played Commander for ten years, this should be obvious. For anyone who played Commander before the Commander precons were available, this should be undeniable. Early casual play saw decks whose focus was creature spells. Multiplayer games demanded ways to maximize your card use, since you had to do more damage. This led players to run primarily creature decks, as these decks could use creatures to attack repeatedly. Even if you destroyed the creatures, there were ways to get them back, even back then. While creatures weren’t good enough for one on one tournament decks, they performed just fine for multiplayer. Then Wizards decided they wanted Magic to be about combat. They made better creatures and weaker instants and sorceries. 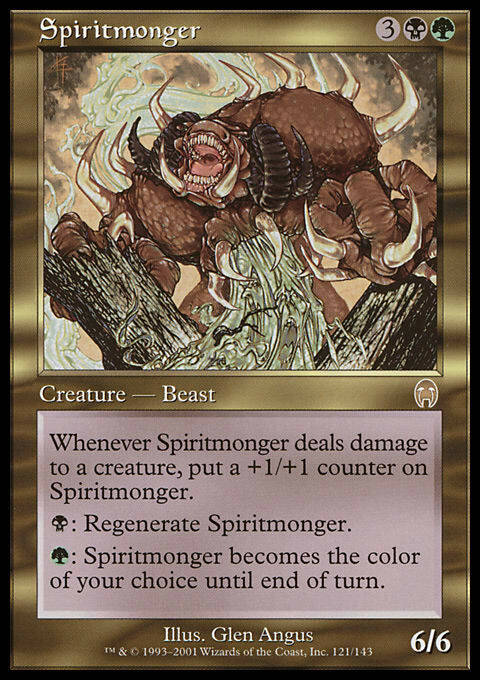 Suddenly cards like Spiritmonger existed to encourage the tournament player to run creatures. The multiplayer format rejoiced, as vanilla creatures started to come out of decks for creatures that could do more things. Power creep had begun in earnest. Wizards realized that creatures with powerful abilities that stayed on the battlefield made for very complicated board states, so they shifted how they made creatures, preferring them to have enter the battlefield triggers, instead of a wall of abilities that made predicting combat results very difficult. This made board states easier to determine and made creatures even better. Now the ability they offer can be repeated every time they enter the battlefield. Whether they are recast, resurrected from a graveyard, bounced, flickered or otherwise, they could be used again and again, forget about the decks that found ways to create infinite loops from those creatures. The next step was in creating the Commander precons. Up until that point, tournament Magic was controlling how powerful creatures were. With a rotating Standard format, Wizards could make a creature weaker than it was in the past to force players to focus on something different in the format. This meant that creatures weren’t just getting better and better since you could still sell a creature that wasn’t as good as the one in the previous set because that older creature was going to rotate out of the format. Creatures had gotten better, but that had plateaued somewhat. With Commander precons, things changed. Wizards didn’t have to worry if a creature broke Standard, since the cards weren’t Standard legal. The designers could let their crazy flag fly and do all sorts of lunacy. As the precons sold better and better, Wizards discovered they could print six and 7 mana creatures in Standard that could do virtually anything, since Standard was fast enough that those cards would not see play. Between Standard legal sets and Commander precons, Commander players were getting amazing Commanders and cards designed for Commander play. It didn’t take too many years for Wizards to realize that if they wanted to keep selling the precons, they were going to have to keep improving them over previous sets. Why would players buy a new precon that was grossly underpowered in comparison to an older set? This saw creatures get even better. Thankfully Wizards has recognized the road they were on and are now producing precons that offer cards that are very powerful, but only in niche decks. 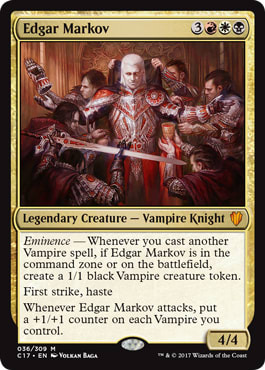 Edgar Markov is a solid creature, but requires three colors and a vampire tribal strategy to really shine. Cool new creatures? Seems Awesome to Me! This is the insidious part about power creep. If power creep is the reason we have all these awesome new Commander options, then bring on power creep! Power creep means I can build an awesome Vampire tribal deck, or run cool kitties, or double all my activated abilities! Power creep brings even more huge plays and insanity to a format that thrives on players getting a chance to make those big plays and do the insane. The problem is that power creep doesn’t do that anymore. Yes the options continue to come and cards do even more crazy and wild things than they used to do. How often do you get to do those things anymore? With power creep comes the shrinking of the mana curve with decks. Past decks relied on big expensive creatures and spells to get the job done. With all the new options, those cards are basically obsolete. Commander used to be a format where the first four or five turns were a way to get land into play to get to your good spells. As the creatures got better, they were coming out earlier and demanding earlier responses. This has produced a format that is far more interested in curving out than it is about being the format where you can play your crazy seven and eight mana cards. We have reached the point in the last couple of years where it has become accepted that a card that costs more than seven mana should just “win the game.” The expectation is that if you can play something that costs seven mana and it isn’t countered, you should just win. This is in a format that used to be about getting to play all your cards! This is in a format whose original name was based on the idea that your Commander was a seven-mana Elder Dragon that could kill one opponent if left unchecked for three turns! Even given all of this, the format would still be fine. If everyone is using the new creatures, then games should still be fun and exciting! Maybe you can’t use your older, outdated cards, but if that is the cost of using creatures that do all sorts of exciting things and offer all kinds of deck-building options, then we should embrace it and move on. And most of us have. With all the new players in the format, power creep is essentially a nonissue for them right now. Everyone is happily running Atraxa, Praetors' Voice and other powerful Commanders that make the rest of their cards so much better. That is the point of Commander! And this is where we get to the real crux of the power creep issue. As cards get better and better, the range between good and bad cards gets bigger and bigger. The space between the player just building a deck, and the player running a deck they have tuned for a while is bigger than ever, and that is due to power creep. This variance in decks makes playing Commander with unknown players more and more difficult. I will be attending PaxEast this coming week (more on that later). Given power creep, the likelihood that I’ll get into games with three other people that prove to be fun and exciting events with each deck getting to do its thing is less than it would have been five years ago. Relying on the social contract to produce good games gets more and more difficult as decks that are fun and exciting and meet the social contract for some, are too slow or too fast for others. It used to be that a deck that fell outside the social contract was probably not in the spirit of the game. How can we say that now when the variance isn’t necessarily due to someone trying to curbstomp a win but because someone is using the fun new cards Wizards provided to them in the precon, and they tuned the deck up a little? The fix is the same as it always has been for Commander. The format is about fun and interaction, so interact with those you are playing with before the game starts. Power creep is making it more difficult, but do your best to find a happy medium with your new friends. I said at the start of the article that I’m not saying the format will be dead in a year. Commander has a lot of flex to it, so I expect it can survive through even more power creep before things become untenable. As long as we are aware of the issue, we can work to keep Commander games fun for everyone involved. It will just involve finding a power balance everyone can live with! I will be attending PaxEast and would love to get some games in with you! I post regularly on Twitter all during Pax and I can usually be tracked down pretty easy. I’m confident we can find some decks and get in some great games! I hope to see you there!